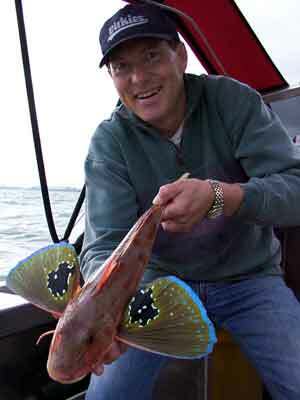 Hi Paul, just a note to let you know that the gurnard have come back. Bret Harris from Waipuk fished both Saturday and Sunday. On Saturday he had one set on his super kite before the wind got up and caught 13 gurnard. The heaviest gurnard was 1.24kg, he also caught one rig and 4 kahawai. He also had a dive at Blackhead managed 4 very good butterfish and 4 big crays. Sunday was even better with both more and bigger fish, the heaviest gurnard on Sunday was 1.58kg. We are still waiting for someone to catch a 2kg gurnard. The first one who does wins a 12 foot surfcasting rod and reel set. The snapper have arrived out in the Bay but I have heard no reports of any taken off the beach as yet. The crays have arrived too, the big bucks are hard in close but the trouble is the sea conditions, a big 4 metre sea is running as I write and we have 60 knots of southeast wind blowing. We are planning a surfcasting workshop for mid July with Gary Kemsley, he will show you how to cast 150 metres and beyond. 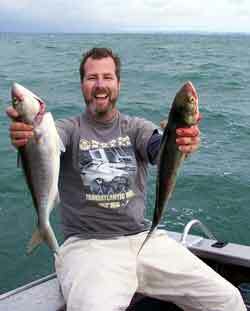 Gary is a well known surfcaster who has written a number of books on the subject. I will let you know of the date. We had a good trip down to No 8 marker on Queens Birthday. The westerly was meant to drop from 10 knots but freshened instead. We worked the boat setline about four times and as usual caught the majority of the catch on it. We used 4/0 target hooks without floats to keep it simple and caught about five fish per set. Another fantastic pic from Paul, Great colours on the gurnard fins. The wind freshened but didn't dampen their spirits. When the swell came up and the large tide started to rip we really had to concentrate on our setting and retrieval techniques. Usually, when I am by myself in these conditions, I run the set line out the back of the boat while on anchor. I put the flag out first then attach a float where the grapnel anchor will be secured later. The knot section follows, traces are clipped on then the last grapnel, downline and flag is put over. Then I simply pull up the boats anchor and run back alongside of the temporary float, swap the float for a grapnel to sink that end. The days catch was made four snapper, five gurnard (two of which were huge ones), five good kahawai, a lovely trevally and four smaller lemon fish. Laurie Crispe caught this 20 pounder in the center of the Manukau Harbour with a rod and reel spooled with 10 kg line. He used mullet for bait. Laurie is my father in law and has been fishing the Manukau for 60 years. The day they went fishing there were two of them in a tinnie. Winds were light southwesterly, the sea calm and it was an outgoing tide. They were fished off Camp Morely and had been fishing for about an hour and had caught a few medium gurnard when the big bugger struck. It took them about 20 minutes to boat the fish and they headed home after they landed it. Laurie was using one of your Target Snapper Hooks which I had given him to try. I have a boat longline of yours and a kite set as well. Are you able to put out the news that while fishing up at Waihi on 10/06/03 I lost my kite please. It is made out of light green material. I don't seem to be able to find fishing spots on the west coast yet you have plenty for the east coast. The only place mentioned for the west coast is Dargaville. Are you able to add Kariotahi and Muriwai? Otherwise we enjoy all your input on this website, fantastic. Ed : It is a massive job trying to work through the maps around the North Island and at the moment we just don't have spare time to do any more web work than we already do. When I started the mapping project I was hoping people would send in area reports so we could put them on the web, but we just haven't had as many as we would like. If anyone wants to help and sends in an area report I will make a map and put it on the web so please help with the mapping project if you can. If you type the name of the beach you want info for into the on site search engine box it will find all catch reports and tips for that beach that are scattered around the site. Hope you get your kite back. We fished our kite longline at Waipu last Saturday on an incoming tide. The wind was a light southwesterly, the surf was calm. We used squid for bait. 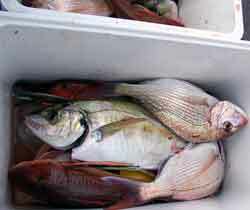 Managed only one set on Saturday before the wind died for the weekend and caught six snapper. It was a great pity about the wind because the snapper are obviously still out there !!! There's always a next time......... Cheers Robin.